One of my earliest memories is being in hospital and while I was there I can’t remember much other than being given marmite toast soldiers. I don’t know whether I’d had marmite before that point but it has been a constant in my life and food cupboards ever since and I’m sure that psychologists could have a field day with the comfort I get from eating it and the links back to that kindly nurse. Lovely bread toasted with lashings of butter and marmite is the most perfect snack food and I drop little dollops into stews, jacket potatoes etc and it always hits the spot. In fact my life improved dramatically when I discovered the perfect quick comfort tea thanks to Nigella – marmite pasta. The whole branding of it I find hilarious as well as they have of course taken it’s divisive qualities (do you know anyone who is in the middle?) and produced numerous witty takes on the Love it or Hate it theme. The jars and colours have remained pretty constant and instantly recognisable over the years, I did dabble briefly with the squeezy version but quickly switched back to the old scrapable jar. 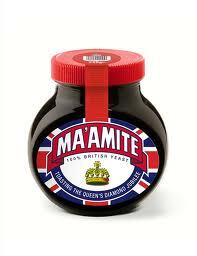 Tomorrow however sees a cheeky rebrand in readiness for the queens golden jubilee with a limited run of Ma’mite which I must admit made me smile. 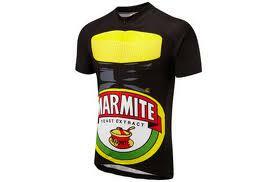 Of course the marmite brand has been used on numerous things over the years but I’m stuck in a quandary as I need to eat less toast so that I can fit into one of these cycling jerseys. So where do you stand lover or hater and what other recipes do you use it in ? I would give one of the wheels off my bike for the cycling jersey. It is great when making a gravy. 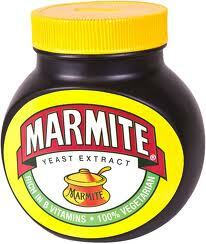 A teaspoon of it adds depth, colour and flavour. Happy Days. never used it when making gravy – sounds perfect on my Yorkshire puds, thanks. Loved it as a kid, rediscovered it during my first pregnancy when it became my craving, adore Twiglets and now, because you made it sound so yummy, I’m off to make toast with butter and Marmite. I’m in the middle! I rarely have it, so I’m obviously not that keen, but then I don’t hate it either.